One of the best things about your big day is spending it with the people you love most. For one UK bride, that person was actually a dog. Estelle and Daniel Harris had their hearts set on a beautiful spring wedding in May. 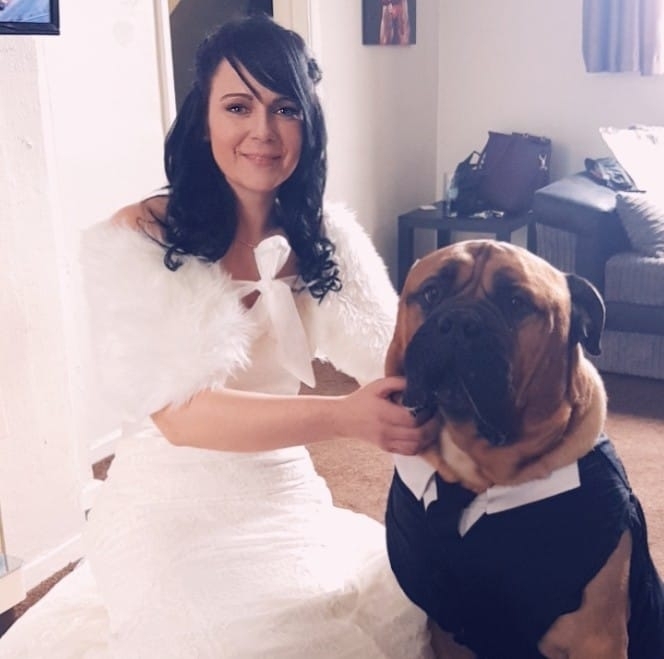 But when they got news that their beloved Bullmastiff, Bruce, had only a few months to live, they decided it was more important to spend their special day with him. Last December the family noticed that Bruce was having trouble breathing and took him to the hospital. There, doctors found a cancerous lump in his chest. During surgery they discovered that Bruce was suffering from a very aggressive form of cancer, and was not expected to live much longer. In fact, vets told Estelle that Bruce may not even live to see the end of the month, and that making it to her wedding in May was even less likely. Estelle and Daniel felt that the memories they made on their wedding day wouldn’t be the same without Bruce. There was no question that they both wanted him to be in attendance. So they quickly scrapped their plans and put together a new wedding, scheduled for only a few weeks out. The sudden changes to their wedding plans meant some guests wouldn’t be able to make it, and they lost payments and deposits that had already been made, but they felt the losses paled in comparison to the gain. On Saturday, January 26th, Danny and Estelle Harris were married, and Bruce was there in his tux. Bruce was only able to celebrate their wedding with them for about an hour before he was ready for a nap, but him just being there made all the difference to the Harris family. They’re now enjoying their remaining time with Bruce, attempting to make him as comfortable as possible.